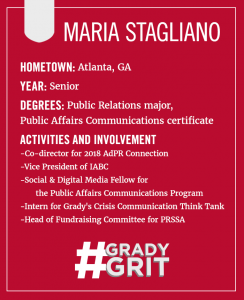 Maria Stagliano is involved in all things Grady, including AdPR Connection, IABC, the Public Affairs Communication Program, PRSSA and more. Why did you choose Grady? I chose Grady because I knew it would prepare me with the skills I needed to be a strategic communicator. Grady has been so much more than a major for me; it is my family. I love hanging out in the journalism building, talking to other students and professors, and learning more about the other majors. Grady has given me friends, mentors and invaluable network connections! One thing I did not expect was to end up doing the PAC Certificate. I went into Grady taking classes for fun–one of which being Professor Watson’s intro class. That class opened my eyes to another way of communicating your message, and now, I am getting a certificate in Public Affairs Communications. It was through those classes with Watson that I also found my love for D.C. It is now my plan to move there after graduation (if I get a job). As a Public Affairs Communications program fellow, Maria helps host events and get more students involved. Who has been your favorite instructor/class? 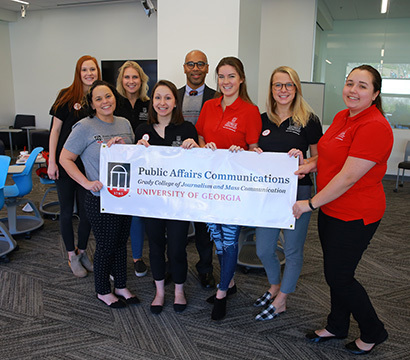 My favorite class at UGA was Professor Watson’s Advanced Public Affairs Communications class. His class taught me so much about strategic thinking and message development. I was surrounded by peers with a range of different political ideologies and different ways of thinking. The best part of the class is the work we produced throughout the semester. By the end, I had an entire campaign plan! What is your most memorable Grady experience? AdPR Connection will always hold a special place in my heart. I transferred to UGA in the summer of 2017 and so I did not have a community yet. Before I was even accepted into Grady, I decided to join a committee for AdPR Connection 2017. I remember the day of the event, it all felt so surreal. I knew so many people and professors already and felt like I had built a small community in a short amount of time. AdPR Connection was the first time I felt like Grady was my home. This year, I got to be Co-Director for the event and that was a true high for me! I hope someone else got to feel the togetherness and excitement that I felt my first time at the event. Knowing what you know now, what would you tell yourself before you began taking Grady classes? Get to know your professors. Grady is one giant network of amazingly talented people–all with different perspectives. If you take the time to make connections, even just one, it will go a long way. Grady is a family, and we all want to help each other out. Eventually, we will all be in the workforce, and you never know who you might run into or work with in the future. 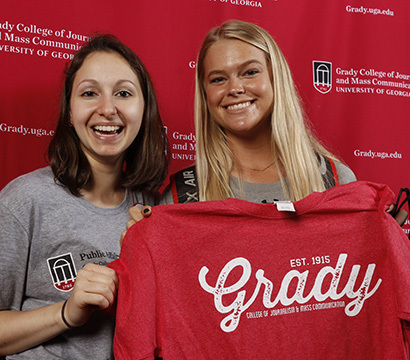 Maintaining good connections, finding a mentor, and learning from your peers will make you so much happier and more successful during your time at Grady. My dream job is to do crisis communications within a D.C. firm. Maria Stagliano shows Grady pride by welcoming Julia Spreng and other students on Grady New Admit Day. I have always wanted to go to Vancouver! What is the best comfort food? Mmmmm lasagna, but I’m biased because I’m Italian. New Year’s Eve with one of my best friends who I met in Grady! What is one thing not many people may not know about you? I am an avid bird watcher so I go on bird identification walks and I bake a lot of delicious gluten-free desserts in my spare time. I also spent my first year of college at a school in Montreal, Quebec studying theatre design. That’s another thing a lot of people don’t know–I used to be a theatre design major for 2 years. That gives me a unique perspective.